Went round a mates house today. Their garden was completely covered in slabs and there was no holes under the fences! This is cutting Hedgehog off when they want to forage. I had words with this mate, told him that his garden was not very 'Hedgehog Friendly'. It's just so annoying! I'm glad that you got that all sorted out. Nasty fances. 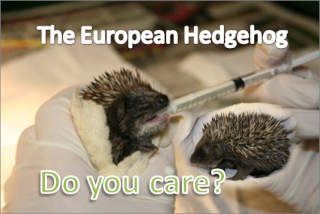 Yeah, thanks to them it is having an impact on the number of Hedgehogs. The only time when I would like fences is when I am enclosing a sick or injured Hedgehog. Other than that... no way! mind you i've got the best of both worlds there,as i have an old duck enclosure with a shed in the garden, so one area is for free roaming hogs and the other is for ones that can't be released. The only thing we can do is to spread the word and not use them ourselves. I have not enclosed any of my gardens. Fences play a big part in the decline of Hedgehogs, they act as bounderies, Hedgehogs cannot go over, round or under; this means they are limited in where they can go.